Randall Thompson(1899-1984): forgotten American composer? Topic: Randall Thompson(1899-1984): forgotten American composer? There have been a few-but very few-references on here to the American composer, Randall Thompson. Thompson was a distinguished academic who served as Director of the Curtis Institute of Music in Philadelphia from 1939-41 and was Professor at Princeton, 1946-48 and at Harvard from 1948 until 1965. His pupils at Harvard included Leonard Bernstein. Thompson wrote a substantial body of choral music, with which I am not familiar. Nor do I know whether much or indeed any of it is still sung in the US (Karl....?). He wrote almost entirely to commission, claiming that this provided both the incentive and the discipline best suited to his composition. I do know Thompson's three symphonies however. The First was the final product of a Guggenheim Fellowship and was premiered in 1930 conducted by Howard Hanson. It is an interesting work with clean, lean textures influenced by the composer's three years in Italy as a Fellow at the American Academy in Rome. Thompson had frequently visited Malipiero during that period and there are certainly some resonance of Malipiero in the symphony. It is on a Koch cd coupled with some Morton Gould with the New Zealand Symphony Orchestra under James Sedares. The Second and Third Symphonies were recorded on another Koch cd with the New Zealand SO under the late Andrew Schenck. The Second was also recorded by Neeme Jarvi with the Detroit Symphony Orchestra for Chandos coupled with some music by George Chadwick. The Second is probably Thompson's most popular symphony(or at least, best known!). Composed in Switzerland it too was first conducted by Howard Hanson in 1932. It is a delightful, tuneful, almost Schubertian piece in which Thompson used the symphony orchestra with a trademark discretion and good taste. I actually prefer the Third Symphony of 1949. It rather sank without much trace after its premiere and there is no doubt that, by the standards of the time, it is an old-fashioned composition but it does fizz along with an infectious energy which is never less than cheerful and uplifting. I am certainly not going to claim that Thompson was a great American symphonist. He pales in comparison with people like William Schuman or Walter Piston and he is definitely no Roger Sessions But if you like the symphonies of Roy Harris, Howard Hanson or Paul Creston Thompson might be worth a go. 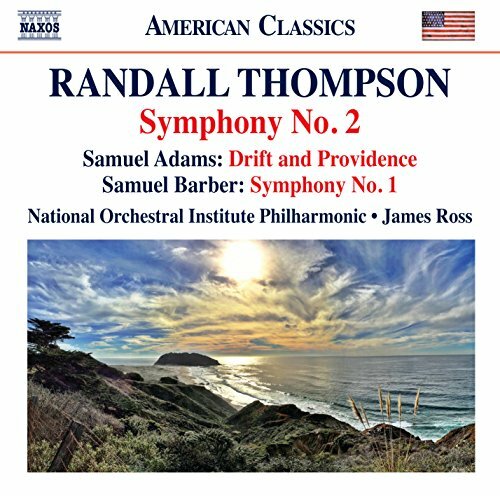 Re: Randall Thompson(1899-1984): forgotten American composer? I have the Koch 2cd set of his symphonies. After the Bate c*** up I shall listen to them again before posting my opinions!!!! Am very fond of Symphony No 2 - I have the Jarvi version + Bernstein on Sony. Everyone needs the Bernstein recording. Listening to No 1,right now. Excitingly orchestrated. One small point. Is it my imagination,or does the sound quality of the second symphony seem more restricted than on the other symphonies? Put the cd player on repeat & No 1 seems to explode into life after the thin,constricted sound quality of No 2. Even the old Bernstein recording sounds better & I have to say,and I'm not a big Bernstein fan,he really gets those rhythms going. The newer performance seems a bit dull by comparison. Next point. The first movement of No 3 is a little repetitive,but the second movement is worth the wait. There's something very Hollywood and swashbuckling about it. Third point. Randall Thompson comes across as a sort of American George Lloyd. Lloyd's Seventh,especially that ott finale, springs to mind. Thankfully,Thompson has a little more,'oomph'!!!!!!! Leonard Bernstein had the ability to take a piece of American music and conduct it with the inspiration which is required to invest in the work the required verve and dynamism. The listener hears the work afresh, almost through entirely new ears. This type of genius can transform a work which, in other hands, may seem simply second-rate, into something much, much more. I am sure that Bernstein does that with Thompson(although I haven't heard the performance myself) but the prime examples are probably the Schuman 3rd and the Harris 3rd. Koussevitsky in Boston, before Bernstein, is another example of a great conductor in American music. This type of genius can transform a work which, in other hands, may seem simply second-rate, into something much, much more. I am sure that Bernstein does that with Thompson(althougfh I haven't heard the performance myself) but the prime examples are probably the Schuman 3rd and the Harris 3rd. Koussevitsky in Boston, before Bernstein, is another example of a great conductor in American music. I've always regretted that Koussevitsky never recorded Copland's Third Symphony, especially as I think he conducted the first performance of the work. Koussevitsky's recording of Hanson's Third Symphony is a fine example of what you say Colin. Specifically, have you heard the 2 String Quartets? From what I've heard, they have an epic quality missing in much early US music? I have to two string quartets (late 80s CD). I prefer them to the symphonies. Have been listening to Symphony 2 this week (Jarvi) - fine work which I like more and more. I have the 3 symphonies and some choral works. I don't have any idea about how his style is. I'll put them on my waiting list. Symphony 2 is the best I think.